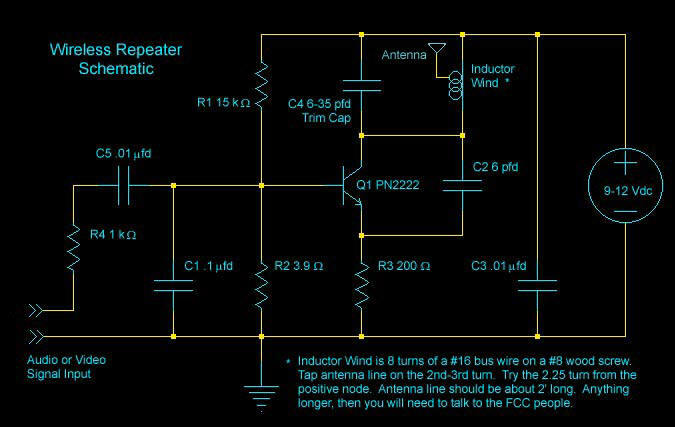 To design and build a wireless transmitter that works over the FM frequency and allows the transfer of a video/audio signal over a certain distance to an FM tuner. The most difficult part of this project was coming up with a design that would work. Because both of us had very little experience with RF signal systems we had to learn, basically, from scratch. The approach we took, was to first create a video transmitter, then add the audio portion later. This way we could test each component individually and then integrate them later when we knew both parts were working correctly. We first went to the Grainger Library to research various transmitters designs and how they were built. Although all the books were very old, we were able to gather some useful information from various sources. Most of the books had only information about sending audio transmission and had very little on video signal transmissions. Also, some books that had some kind of designs and data for video tranmission were very outdated. But we found some interesting standards that help explained what television stations used. This was not too far from what our original intentions were on building two different types of transmitters. Let us first look at the basic block diagram of what and how Audio/Video transmission works. 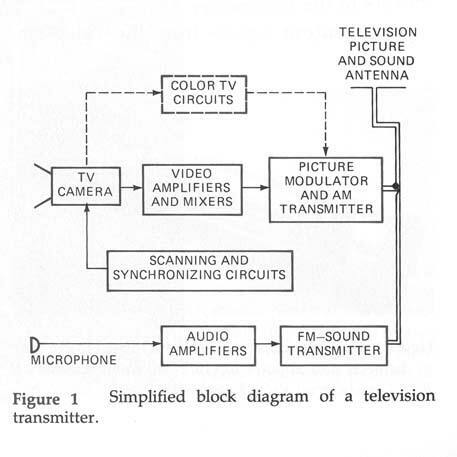 From the book: Television Electronics by Kiver and Kaufman (8th ed.) 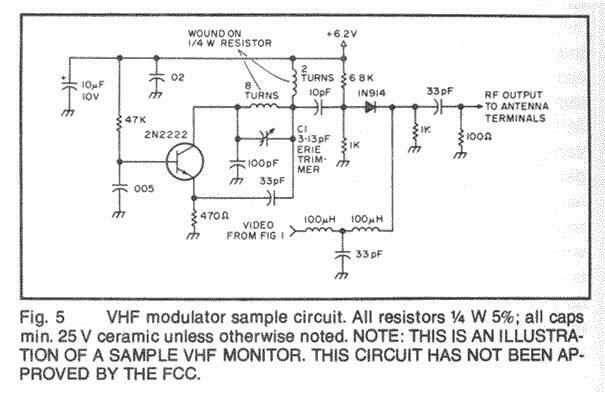 Copyright 1983; there is a block diagram of the television transmitter (page 9, Kiver and Kaufman). As you can see, television signals operates as two separate transmissions. One for the video and the other for sound. And just like our project, two different devices are going to be built. As noted before, most of the books we used from Grainger Library were older than us, so all parts used listed (tubes and such) were outdated and not readily available to us. So the search goes on to finding another solution. Let us look at some of the industry standards that might help shed some light on this project. From the book: Radio Frequency Transmission Systems by Whitaker (1st ed.) Copyright 1991; we see some of the standards set by the U.S. Federal Communications Commission (page 44, Whitaker). 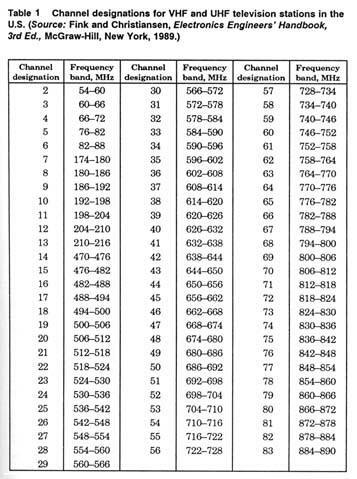 Below is a table that show the specific frequency band assignment to the channels designations (page 45, Whitaker). From the table above, we see that all channels assignments are 6 Mhz apart. 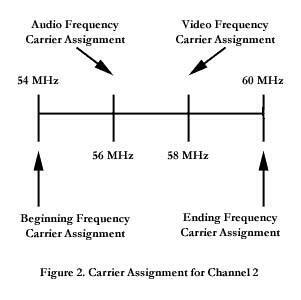 And from Kiver and Kaufman (page 20-21) there is a listing of all of the corresponding television channels to their frequencies with much greater detail showing the picture carrier and the sound carrier assignments. Although based on cable standards, it is identical to the airwave standards set by the FCC. Within the 6 Mhz range the picture and sound carrier are within 2 Mhz from the ends and also about 2 Mhz apart from each other. This leaves about 4 Mhz in between each channels. After searching high and low we have come across a diagram of some audio transmission schematic which was claimed to also be capable of transmitting video signals. The device was later found out to be known as the repeater. In the following pages we have printed up the schematics that we used to build our devices. Two devices were built (as noted above as to why two different transmitters are needed). We had various difficulties with implementing the video transmitter design. We discovered that somehow a 9v battery did not deliver enough power to the circuit produce a strong clean signal. So a bench power supply was used to run the circuit. We have also learned that not using an insulated crossdriver to tune our circuit to the correct frequency gave us a lot of problems. So, for an alternative solution, we used an old clock/radio/TV with an analog tuner to test our design. This allowed for fine tuning with a plastic knob when searching correct frequency. The audio transmitter eventually worked. But the audio signal was wrought with interference and fluctuations depending on the distance between the transmitter, the receiver and the position of the transmitter's antenna. Also, since the devices were built in a very crude manner, it was very prone to noise interference creating highly distorted signals. There was another design for video transmission found from the book: The Giant Book of Electronics Projects by The Editors of 73 Magazine (1st ed. 16th printing) Copyright 1982 (page 464). Overall we learned a great deal about RF signals relative to how much we knew before hand. We recommend taking an RF signal class such as ECE353 before undertaking any sort of RF project. This project can be greatly improved on for those interested in RF transmission design which most people take for granted when listening to their favorite band on the radio or watching football games on the TV. Video/Audio Wireless Transmitter electronic circuit. Video and TV electronic circuits and schematics.